We recently were invited to join our neighbors for dinner at a local Indian restaurant. Having never experienced Indian cuisine before, we were excited about a new adventure in culinary delights! After a short train ride, slipping through a busy station, & finding the correct exit... we found ourselves walking down the chilly, bright streets of Tachikawa. If we hadn't been with our friends, I would most likely have walked past the restaurant entrance. 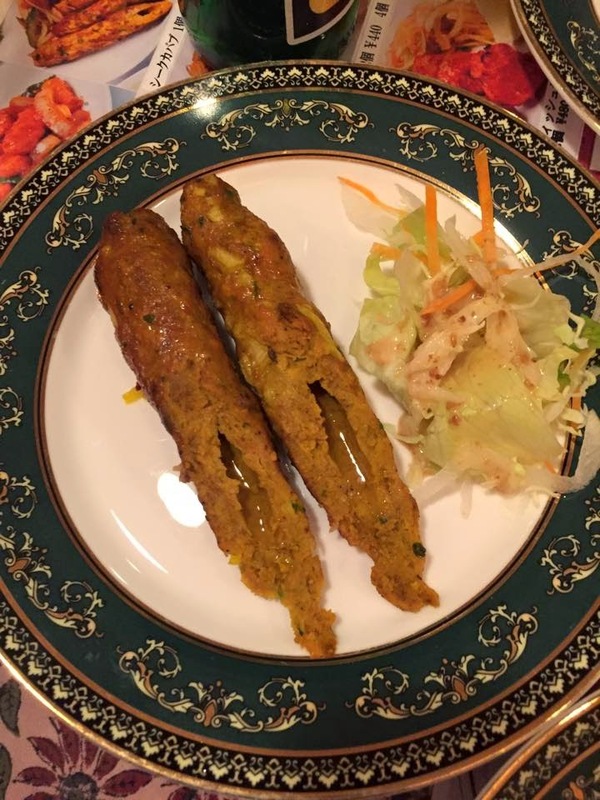 The Shravan Indian Restaurant is tucked away in a downstairs locale, but upon entering you are met with a warm, homey atmosphere. The staff is comprised of the owner, who serves the front of house, and two chefs. 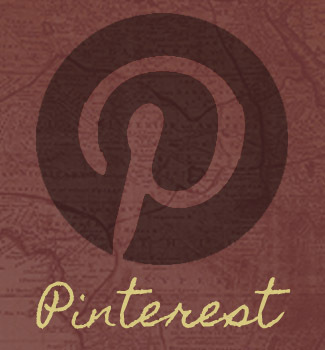 The restaurant is quaint, with few tables which portrays a relaxed dining experience. Our host was very gracious, allowing us plenty of time to make our choices, and never rushing our courses. I decided on a meal that included salad, a small appetizer, curry with naan bread, and dessert. 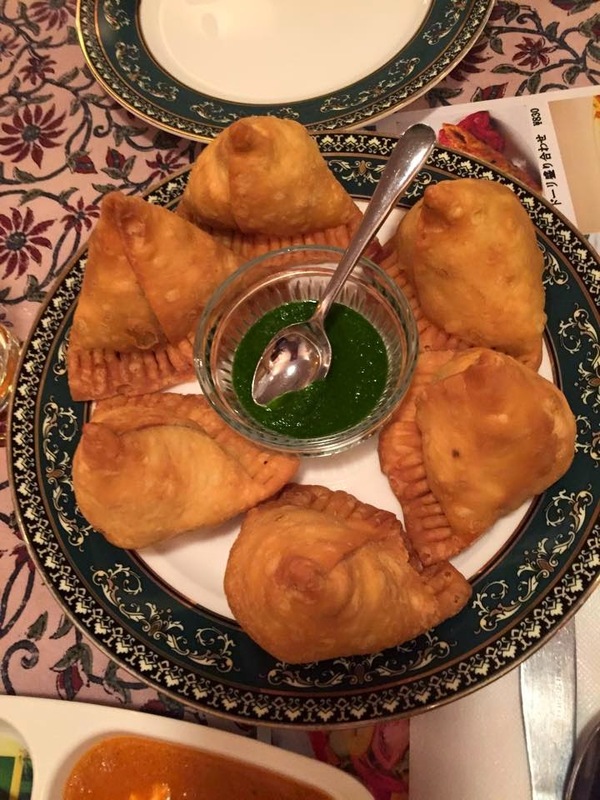 Upon recommendation, we tried samosas! These delicious, fried delights are filled with a mixture of potato and fragrant spices & served with a spicy cilantro sauce. We each enjoyed one, as they are quite large, but I did not particularly care for the sauce. After samosas, our salads arrived to the table! I really wish i had thought to ask what kind of dressing was used, because it was absolutely divine!! I also received a sampling of sheek kabob (mutton) as my mini appetizer. It was absolutely delicious! The meat was tender and full of fragrant spices to entice the taste buds! I had never even considered eating mutton before in my life, but I would gladly do it again! Perhaps I'll try their mutton curry next time! This restaurant is very child friendly, and my lil man enjoyed a plate of butter chicken curry, yellow rice & chicken, salad, and sweet naan bread. He devoured every single thing on this plate! After we enjoyed our appetizers, our main courses arrived. I chose Spicy Chicken Curry with Butter Naan..... best. choice. ever!! I was slightly apprehensive about ordering a spicy dish, but there was just enough heat to enhance the flavor. We were given spoons with our bowls of curry, but it was much more satisfying to use chunks of bread to soak up all the deliciousness! Our final course was dessert! I have never been a huge mango fan, but decided to give it a go. 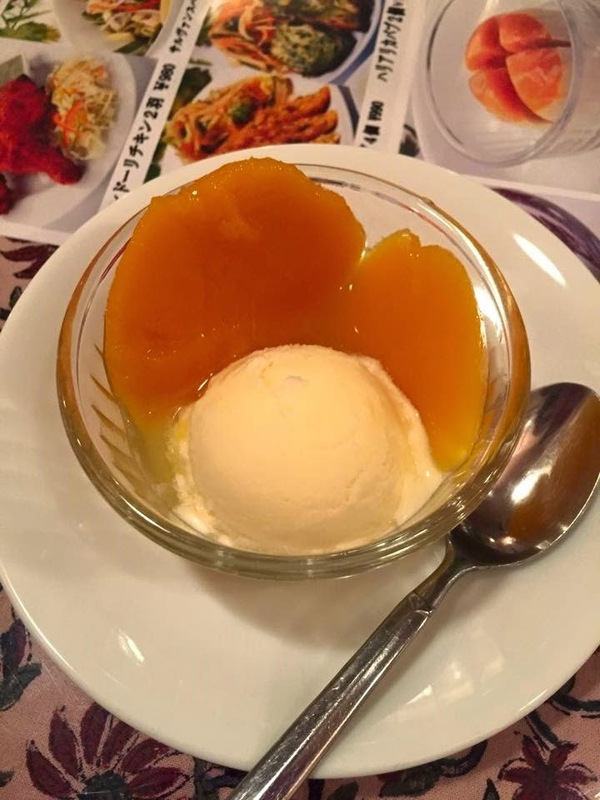 I chose Mango Delight... sweet mangos with vanilla ice cream. After enjoying this delicious treat, I had a change of heart & can't wait to eat more mango in the future! 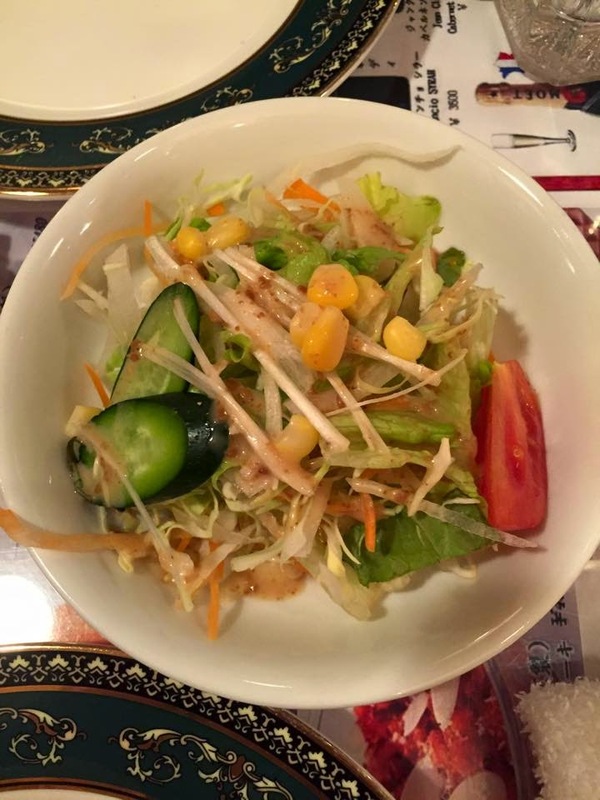 We are looking forward to our next visit to Shravan, and will be trying more delicious foods! Mmmmmmmm! This place sounds incredibly delish. Dining at an Indian restaurant is on my bucket list. The curry and mutton and naan I want. the naan was sooo delicious!! 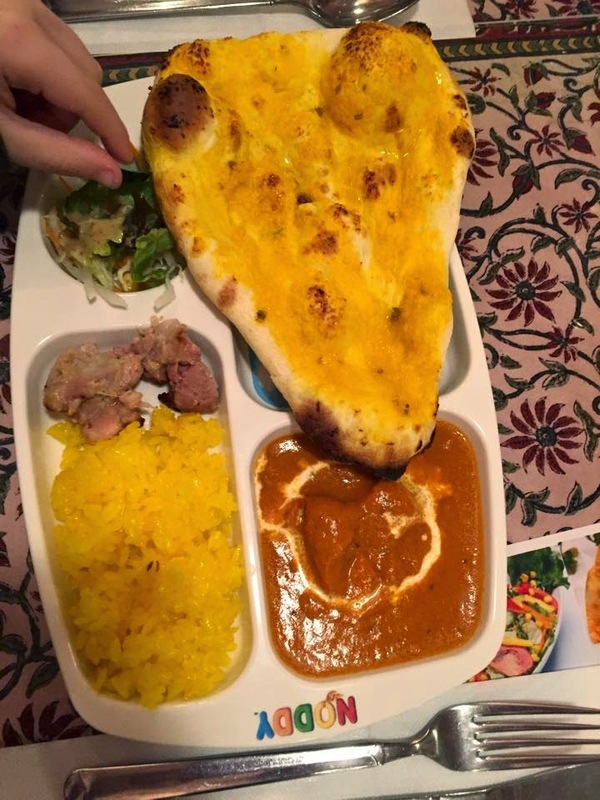 If you haven't checked Indian off your list when you visit, we got it covered! 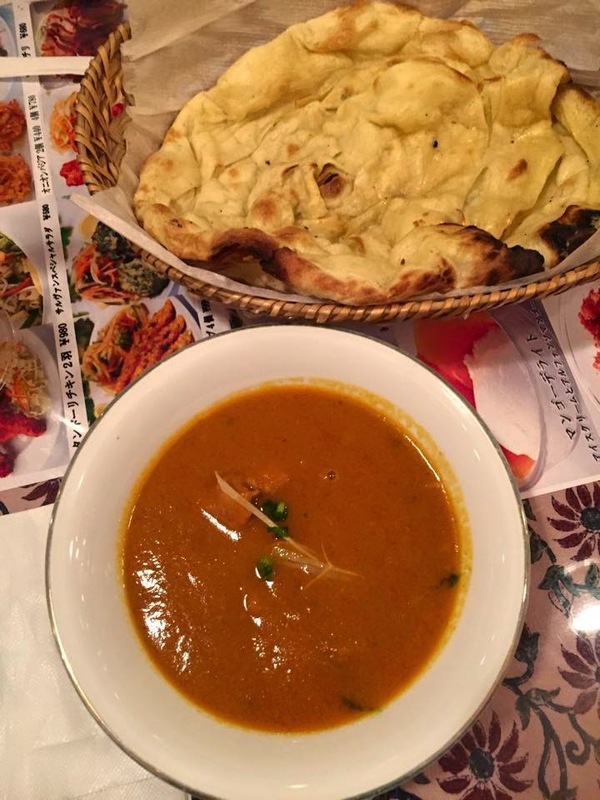 Indian food is my favorite comfort food cuisine! The lunch buffet is a common feature at Indian restaurants. I'm pretty sure they lose money when I come in. I can see why it's comforting and popular! the curry was amazing! thanks for stopping by! Fukubukuro 2015 - Get Lucky!! Japan Eats: Dinner from Walmart!